The spectacular St John's Residence is surely one of the most special properties on the island of Rhodes. An unforgettable mansion close to the capital. The spectacular St John's Residence is surely one of the most special properties on the island of Rhodes. An unforgettable mansion close to the capital, it offers the ultimate luxury experience, with a stunning outdoor pool, exquisite interiors, a helipad and a host of extra services available. Sat on a private hill, with 24-hour security, St John's Residence offers the privacy, seclusion and discretion you would expect from a property of this type. The outdoor areas are on a grand scale, and offer virtually everything you could think of, including a swimming pool, two hot tubs, a gazebo with barbecue, a pool bar, large lawn and an incredible nine lounge areas. 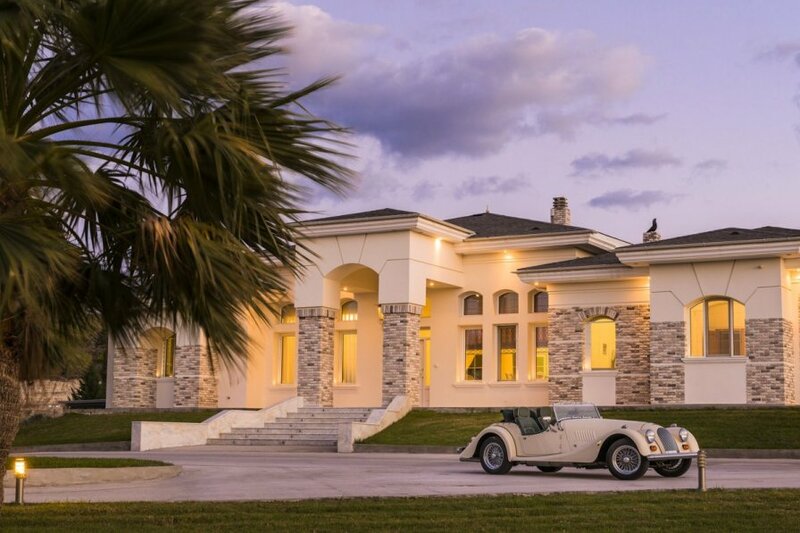 A 500m private road leads to the property, emphasising its exclusivity. The main house is suitably elegant and offers a similarly extensive list of special features. A fully equipped kitchen connects to a lounge, and there is also another living room with fireplace and two dining areas. In addition, a second (professional) kitchen can be found in a separate building – St John's can also supply a professional chef to cook for you in it. The master bedroom offers two dressing rooms and an en-suite bathroom with hot tub and shower. A further two suites, three king-size bedrooms and three bathrooms take care of the needs of another ten guests. The house is big on technology, with eight smart TVs, two iPads, built-in Bluetooth-enabled speakers and Wi-Fi. If you're after fitness and relaxation, the wellness and spa corner offer a steam room, sauna, gym and massage room. A popular venue for a very special weddings, St John's Residence is the place to be for the VIP treatment. Whether you need concierge services, a massage, table reservations at the island's best restaurants or yacht or helicopter rental, their time will be on it for you. The price includes the services of House Manager, Housekeeper and Chauffeur (who live in staff quarters on site, completely separate from the main house). They will even drive you down to the beach – another nice advantage of being in this part of the world. The house is completely private, situated up a private hill and not visible from outside. It's a short drive to the beach, supermarket and restaurants. St. John's Residence is a 15 minute drive from Rhodes international airport, Diagoras, and about 20 minutes' drive from the Rhodes Town. It would be a shame to miss out on discovering its charms for yourself. The town of Rhodes is as good a place to start as any and lies on the northern tip of the island. A walk along the medieval walls of the Old Town will offer you some beautiful views, accessible from the must-see Palace of the Grand Masters. Part of a World Heritage Site, this is also the location of a fine museum which offers the chance to familiarise yourself with Rhodian history, extending as far back as the 3rd century BC. Another museum worth checking out is the Museum of Modern Greek Art, with an eclectic collection only rivalled by Athens. The New Town area is visually appealing itself, with an Art Deco influence present in much of its architecture. Mandraki harbour is the home of Evangelismos Cathedral, where you can find some impressive frescoes. Along the coast the Lindos Acropolis is as spectacular as the coastal views it enjoys, and definitely worth seeing. Down the coast, you also have resorts such as Ammoudes, Kolympia and, perhaps best-known, Faliraki. While its reputation may precede it, this is not the hedonism capital it once was. A children's water-park and the beautiful Anthony Quinn Bay may tempt you there during the day, and an aquarium and scuba-diving school also embrace the aquatic theme. At the very southern tip of the island, Prasonisi's location – dividing the Aegean and the Mediterranean – is considered prime wind-surfing territory. But if that sounds a little too exhilarating, Rhodes' more sedate attractions like the Valley of the Butterflies, numerous wineries and the seven springs of the wonderfully scenic Epta Piges nature reserve, will provide just as pleasant a day out.